At a later point in time, this would become known as "the war of contracts", an artificially created situation that would allow the entrance of third-parties. The result of that time is still undefined. “All of that crashed when a different person became president of the United States,” Howe said. Ah so evil swooped in and stopped the good guys from releasing the truth. I'd buy that if these "good guys" weren't associated with rumors of human trafficking, murder, fraud, and satanic hobbies like spirit cooking. 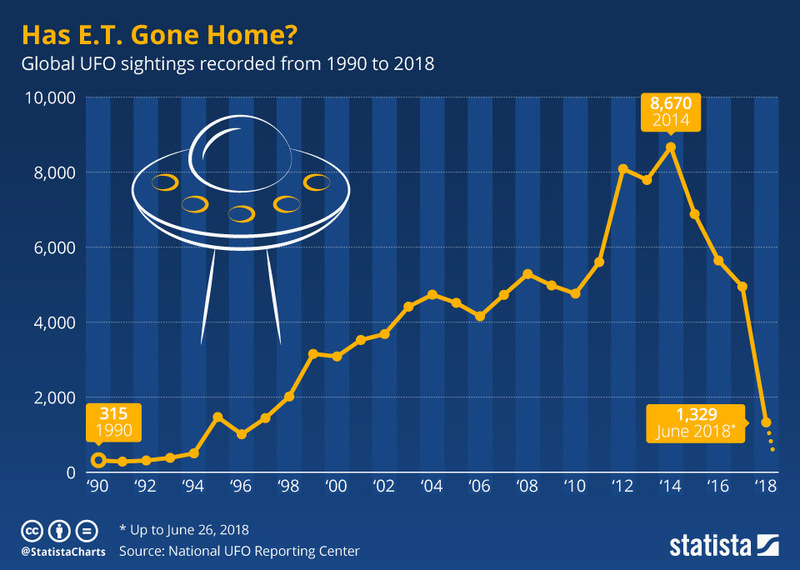 But that's no surprise considering who their alien benefactors are, the ones orchestrating a false disclosure agenda since the 1960s that was in full swing by 2008. Sightings peaked in 2014 and then massively dropped off. Maybe there's an ordinary explanation for that, but to me it looks like the plug being pulled on viral marketing by UFOs. Why? Is 2014-2015 when things shifted, when the events of late 2016 became probable enough that they saw the writing on the wall and cut their losses? If so, then that means their "ground game" has lost its momentum and that suggests their human proxies (political puppets) are in peril. Just throwing it out there as a possibility. I think Syria and North Korea should have been easy flash points for nuclear WWIII by now, but that hasn't happened. Time will tell if/when/how a War of Contracts will occur. Plus there are factors that politics can't control, like climate and solar/cosmic catastrophes that would change things overnight. All it takes is one big volcano to cause mass famine, political unrest, regime changes, fanaticism, desperation, and nuclear conflagration. Last edited by montalk; 08-29-2018 at 08:13 AM. I agree that any if the events above take place or ramp up more than they are already going on, it could be TSHTF for America. If the supply chain is interrupted by one or more of these events, the bigger cities will surely be ruled or taken over by the Gangs roving around lawlessly for food, wealth, guns and their own sick fun. That's JMO. With the timeline, I suspect that regardless of what happens before the main event, the main event will still happen. The only thing of significance is who will be around afterward, and that has more bearing on the final results; this appears to the greater area of concern for other entities in the leadup to the main event. 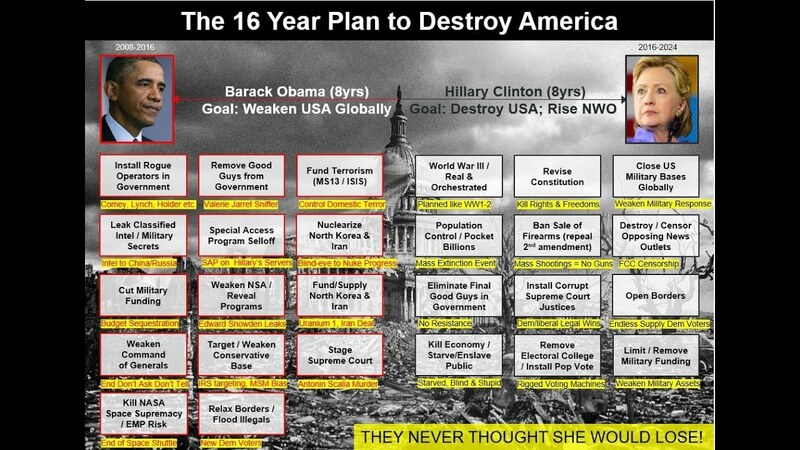 Keep in mind that Fore mentioned that the NWO scenario would be a big thing, but never actually successful. I suspect, however, that is more likely a later scenario (either post-event, or just before the event). Note I don't specify the event, I'm aware that something happens, it causes massive devastation, and the period afterward is a time of weakness for Humanity. I'm personally very cynical of the US government in general, looking at what they do instead of what they say. In general, it is likely that she was simply saying what she needed to say in order to attract more votes; regardless of who they came from, as long as they were not universally reviled. Equipment movement, relocation, and preparation. The level has now dropped to stable in anticipation of the main event and remains fairly high compared to prior decades. To put it in perspective, a being that has contacted me before contacted me around April of this year. It is a being that has always been concerned about my status as single... it contacted me, with a somewhat amazed/surprised state, to inform me that my girlfriend was going to have a girl... that I don't have a girlfriend and most certainly haven't impregnated anyone is beside the point. The fact is, it wouldn't go out of its way to inform me unless something was going to happen. Check out the Idlib province Chemical incident when it happens, it's staged, and it is a spark point. If that doesn't happen, then we'll have the meteors to worry about instead, although I'm not 100% sure when that hits, could be a few years, could be well after other environmental disasters have been. I'm no prophet, just aware of things down the pipeline; this is a highly unstable period of time, lots of governments are teetering on the edge. @epo333 Scary how fragile our society is. Seems like the minimum effort, lowest cost, short-term profit approach to everything has created a systemic lack of preparedness, backups, redundancies. People have had it too good for too long: Carington Event (solar) was 1859, Year Without Summer (volcanic) was 1816. Only gov/mil with inside knowledge and the "lunatic" fringe are doing any serious prepping for the inevitable. I'm a big proponent of people being informed and prepared. The good shouldn't have to die young. Equipment movement, relocation, and preparation. The level has now dropped to stable in anticipation of the main event and remains fairly high compared to prior decades. Great point. That was my initial impression of what was behind the drop in activity. Well, looks like no matter how things go in the near future, in the long term it would all funnel through the same wood chipper then. To put it in perspective, a being that has contacted me before contacted me around April of this year. It is a being that has always been concerned about my status as single... it contacted me, with a somewhat amazed/surprised state, to inform me that my girlfriend was going to have a girl... that I don't have a girlfriend and most certainly haven't impregnated anyone is beside the point. The fact is, it wouldn't go out of its way to inform me unless something was going to happen. Was this being referring to a current "space girlfriend" (sorry I don't know the proper term) only known during abduction/contacts, or someone you have yet to meet here in your regular life? If the latter then I guess that implies things stay stable enough for at least a year or two if such a thing is going to happen. There was a being, however, that was interested in training "today we are going to do some dangerous things with a spear." I bought the spear kit afterward when I went looking for it, the Zubin Axe Multitool Staff. The implications there would suggest I need it for later on. I note that a climate shift is definitely underway, so we're likely not far off from the superstorm period. Based on what Fore said, this would be a two-year cycle. So, 2019, 2021, 2023 etc. "Out-of-season tropical formation is FAR more unusual in the eastern Pacific than in the Atlantic. No tropical system has ever been recorded prior to May in the eastern Pacific (since records began in 1949). @NHC_Pacific giving 50/50 odds of a January first." Overall, these are indicators that a tipping point has been reached, so my expectation is that things will go downhill in the near future. I would recommend that you don't live near the sea, a river, or a body of water if you have the choice to do so. We are currently in a period of various showers that normally occur, with far more cameras to capture these events. The sky is not falling, yet. I've noticed that earthquakes, some strong, seems to follow violent weather. Have you seen any confirmation of this? [FONT="]"Out-of-season tropical formation is FAR more unusual in the eastern Pacific than in the Atlantic. No tropical system has ever been recorded prior to May in the eastern Pacific (since records began in 1949). [/FONT]@NHC_Pacific giving 50/50 odds of a January first." All I can say is 2018 has been one of the wettest years I seen here in Up-State New York in the 40yrs I have lived here. November had 5 dry days and Oct had about 6 dry days. Crappy spring and summer too actually. So far, December and into January, we have been above average temps . . . just not normal for sure. I cannot confirm from my end, but I can confirm that the weather has been getting much more violent over the past several years. In my case, it is simply the wind, every three or so months a new stronger storm passes through and brings down the weakest trees. It's actually reaching the point that any tree that had something to come down (limbs/branches) has now lost it, and that entire trees now fall over when their time is up. Generalised building damage is also gradually getting worse around the country, based on the stories from people who are discovering that their windows are cracking with the strain. However, given my proximity to the ring of fire, I am expecting a subduction zone induced earthquake to take-out most of the infrastructure to the east and south of me. Should that destabilise the dormant volcano in Lake Taupo, then you'll know it's happened when you hear the explosion in the US and the skies worldwide turn to night for 4 days. As a calculation, the warming effect of the CO2 being dumped into the ocean has now reached the point that the heat energy is equivalent to the two nukes detonated in Japan happening every second. Acidification via transformation into carbonic acid (H20 + CO2 = H2CO3) aside; almost everything in the oceans will die if that isn't stopped. All that heat leads to an interesting effect, which is that the total energy required by the weather system for "interesting effects" is given a leg-up. Storms last longer because they start from a better base, and are supported by it for longer. Storms receive the same amount of energy they normally do, but they start at a higher level. For those of you who look at the hurricanes hitting Florida, you can put a category 10 storm from the past next to a category 10 storm of today, and note the recent one appears 3-4x larger; because it is. Right now, the situation is this, it's simply going to get very bad. If there is an all-stop and massive effort put into stopping this, then the Human race can stop it from getting worse about 25 years from now. Those 25 years are going to be hell as matters run their course. However, if things keep going the way they are, then things will be bought to a stop because the storms and weather effects will be so bad that the Human race will lose the ability to maintain civilization. Eventually, matters will calm-down, and the survivors left to rebuild from the rubble will have very interesting stories to tell their children. You can expect that whoever rebuilds from that is going to make absolutely sure that they don't repeat the mistake the ancients made; if they have that opportunity. I also expect such a group of people to become extremely religious after that.